Johanna Tiffe is industrial designer. Since 2009 she runs the studio form:f in Berlin. 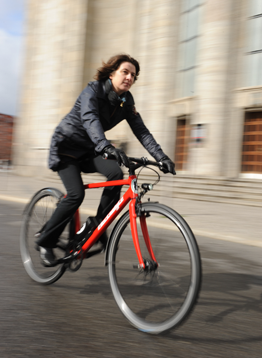 The designer is engaged in mobility and two wheelers since her diploma at KH Berlin in 2002. Mobility is for her the most fascinating topic in design and an important challenge for our future. In the end of 2007 Johanna Tiffe started to focus on projects in the field of e-mobility – LEVs and infrastructure. The services of the studio are: product and graphic design, 3D modeling and construction. Beside she works as a consultant. Since 2017 she amplified her focus into the field of digitalisation.